In this article we will look at 5 different models of Emjoi Epilators. Emjoi is a well-reviewed brand of face and body epilators and a leader in hair removal. Hopefully this discussion of the features, benefits and drawbacks of the different models will help you make a decision about which one to choose. This epilator is designed to remove even the finest hair right from the root. It is a top end epilator in terms of budget considerations and offers long-lasting hair removal; hair is also finer when it grows back. There are very few negative reviews of this model of epilator. Double heads make it much faster. Reviewers say hair removal effects last longer between sessions, whereas cheaper models need to be used more often and take longer. Reviewers comment that stubble does not appear after epilating. One reviewer says the Emjoi Optima is the right size. The 40 tweezers and dual spinning heads, as well as curved sides, helps reduce pain and reduce pinching of the skin. As it’s corded it’s more powerful than cordless models. This model of Emjoi face and body epilator offers the most tweezers on the market and promises to remove most of the hair the first time, which saves you time and possible skin irritation. Let’s see what the reviews say about how effective it is. Removes hair as short as 0.5mm from the root. Convenient rechargeability – you can epilate wherever it’s comfortable for you, which may not be within wire-length distance from the outlet. Opposing tweezer heads are more efficient for hair removal, especially if you are epilating a large area. This model has a double head which enables it to grab more hairs out faster. One reviewer commented that this model is less painful than other epilators. It is a higher priced model. One epilator reviewer said that this model is very noisy when in use. It has been reported that there is often the need to go over the area more than once to remove all the hairs. Unlike other models, an optional shaving head is not included. The replacement epilating head is only available on the manufacturer’s website. 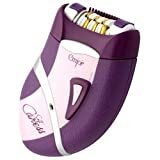 One reviewer said that this epilator is less effective at getting hold of the shortest hairs, as it is advertised to do, possibly because the head is curved so the tweezers do not come in close enough contact. Much more affordable than the Emjoi AP-18R, this model offers a few extra features and is suitable for hair removal on lots of different body areas. Soft touch grip fits comfortably in your hand. Extra features: massaging finger attachments, dual speed control and an adapter. Reviews indicate that the pain reduction technology is very effective, helped by the vibrating edges and massaging finger. Works well with shorter hairs. Unlike some other models, one reviewer reports this epilator does not cut the hairs in half. Some reviews indicate that ingrown hairs are not a problem as they can be with other models. Reviews indicate that this epilator can sometimes catch the skin which is painful. Some reviews report that stubble rapidly reappears after using this epilator. Facial breakouts have been reported following use on the face. This epilator is the budget conscious option and offers pain-minimising technology. Flat and short hairs are guided into the hair-removal disc using patented hair guide channels. Unlike some epilators, reviewers say this one doesn’t grab the skin and tear it, due to the well rounded shape of the metal tweezer’s pieces. The rounded shape of the head can make hair removal in certain places more difficult – e.g. around the knees. This epilator tends to drain batteries quite quickly. One review says that when epilating regrowth this model doesn’t catch every single hair with a single pass. This model is very affordable and offers a more powerful motor for better and less painful hair removal. Removes hair from even the most delicate areas such as upper lip, chin, bikini line and underarms. 9 tweezers removes hair from the root. Reviewers say it’s very efffective for removing facial hair, and works much better than other methods of facial hair removal. In this article I have covered the 5 most popular epilators in the Emjoi range. I hope this has given you a better idea of which epilator is the right one for you. If you are looking for a budget friendly option, my recommendation would be the Emjoi Divine. At the price it sells for, you can’t go wrong. This is the ideal model for the first time epilator buer. On the other hand, if you are looking for the absolute best Emjoi epilator, I would have to recommend that you go with the Emjoi Optima. As the name suggests, it is the top of the line epilator, and will not disappoint.